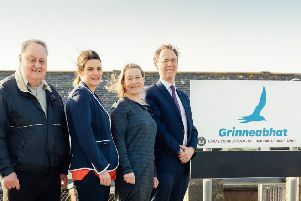 Coming to Biggar on Thursday...Let's Get On Roadshow, originally launched by singer and TV presenter Michelle McManus and Scottish Government Minister Keith Brown. A NATIONWIDE roadshow is set to help people across Scotland get online. The Scottish Government’s Let’s Get On team will visit 75 towns and cities offering free, drop-in sessions on how to get online and the benefits the internet can bring. Friendly staff will host over 90 sessions at locations ranging from supermarkets to sports clubs. They will demonstrate online activities such as how to set up an email address, tips for safe internet shopping and how to video call friends and family. The roadshow will call at Biggar Co-op, at the Old Auction Market, on Thursday, May 7, from 10am to 6pm. Cabinet Secretary for Infrastructure, Investment and Cities Keith Brown said: “We want everyone in Scotland to enjoy the benefits of being online. There is also an information line on 0300 004 1000 or simply visit www.letsgeton.scot.